What most people call X-rays are actually X-ray photographs (also known as radiographs). An image is made using X-rays, which are similar to sunlight, but of a shorter wavelength, and able to show us what’s below the surface of a tooth. Even though we call them X-rays, we are actually referring to the image created by X-rays. X-rays are the only way to identify problems that aren’t externally visible. X-rays are very essential in doing a complete and thorough dental examination. They are especially important in diagnosing serious conditions early to allow for effective treatment before you experience discomfort. X-rays show bone anatomy and density, decay between the teeth or how extensive the decay is, whether an abscess is present, impacted teeth, or if children have permanent teeth. No cavity on first X-ray. Months later, cavities that start between the teeth can’t be seen by visual examination, but they can be detected on an X-ray. This cavity was detected and filled before the patient felt any discomfort, and before the nerve became infected or the tooth became abscessed. 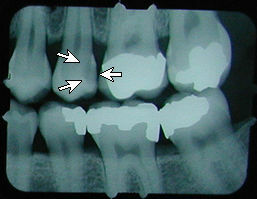 There is another cavity shown in the X-ray on the right. Can you find it? It’s difficult for the untrained eye to spot. If you think you know where it is, contact us and we will tell you if you’re right! (Hint: It’s not the left edge of the top left tooth. That’s just the edge of the frame around the X-ray). The number and type of X-rays you will need depends on several factors such as age, current dental health, and external signs that may trigger a cause for concern. We are sensitive, however, to your concerns about exposure to radiation, and we only perform those X-ray procedures that are necessary for your continued dental health. 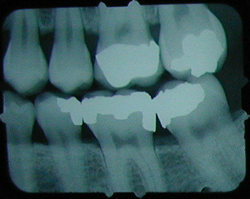 If you have any questions or concerns about dental X-rays, feel free to discuss them with any of our staff. They are highly trained in the prudent and effective use of dental X-rays and share your concerns about exposure levels.